Why oh why can't we get one in the US? Americans avert your eyes because as pretty as it is, there is little to no chance this new BMW 5 Series Touring will be flung over our solid soon-to-be reinforced border walls. Instead, we’ll get the uglier Gran Turismo model, which us enthusiasts love to hate but American consumers still buy in droves. With the North American continent out of the picture, BMW thought it timely to peel the wraps off the wagon version of the new 5 Series, aptly named the 5 Series Touring, ahead of the Geneva Auto Show. Designed specifically for the European market, the new BMW 5 Series Touring will offer copious amounts of storage and capability packaged into a dynamic vehicle that’s sure to be a pleasure on long drives. 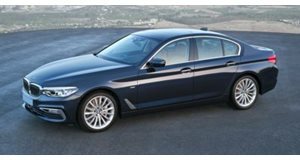 During its upcoming world launch in Geneva, the 5 Series will come fitted with four engine options that will be available when the car goes on sale in June of 2017. These include a 252-horsepower four-cylinder 530i, an inline-six 540i with BMW’s xDrive all-wheel-drive system pushing 340 horsepower, a four-cylinder diesel 520d making a paltry 190 hp, and a respectable 265-hp inline-six diesel model, the 530d and its all-wheel drive alternative, the 530d xDrive. All models come mated to an eight-speed steptronic automatic transmission with the 520d retaining the ability to be optioned with a six-speed manual. Typical of BMW and its bloated lineups, more rear-wheel drive and all-wheel drive variants will follow and though it seems unlikely, we pray BMW builds an M5 Touring for the sake of our “petrolhead” family across the Atlantic. While the new 5 Series touring retains the standard 5er's aesthetics (giving us the closest look at what a 7 Series wagon could look like), BMW didn’t just change things up at the skin level and under the hood. The chassis is also lighter by more than 220 pounds thanks to aluminum components and high-strength steel, making this version more rigid than the last. Together with a more efficient drivetrain, the 2017 Touring 5er can boast emissions improvements of 11 percent over its predecessor. This number was eked out thanks to small improvements like the Active Air Stream Kidney grille, which, together with a long roofline and raked D-pillars, help maintain friendliness with the wind while making for a sportier look. Technology makes a prominent appearance in the picture thanks to remote parking, an active self-leveling air suspension for the rear axle, and BMW’s latest connectivity goodies including an in-car WiFi hotspot. Improving accessibility to the 20-60 cubic feet of rear storage space (with seats raised or lowered) is a rear window that can be opened independently of the aluminum trunk. As a sleek alternative to a minivan (who are we kidding, European parents are too cool for minivans, hence the wagon craze), the 5 Series Touring has the capacity to load three car seats on its rear bench, and for the heroic parents up front, leather seats with eight preprogramed massages are available along with gesture control, wireless phone charging, a head-up display, and the latest version of BMW's iDrive. Pricing for European models hasn’t been announced for the new 5 Series wagon but don’t expect it to deviate much from the previous version. Meanwhile, Americans must keep buying crossovers as punishment for this self-inflicted wagon drought we continue to face.